The CRISPR-Cas9 system defends against phage and conjugative plasmid infection. First the cell incorporates the invading DNA into a CRISPR array. The cell uses the CRISPR elements to distinguish between genomic and invading DNA (Marraffini & Sontheimer, 2010). 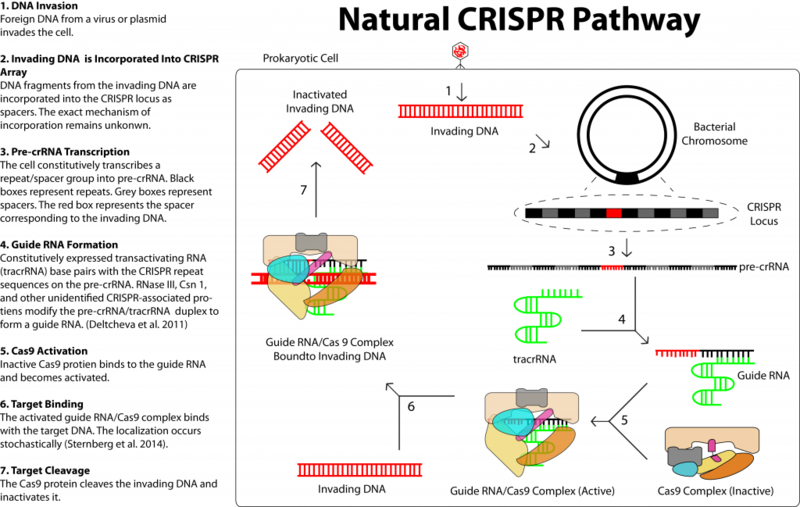 Next a CRISPR unit is transcribed to a CRISPR RNA (crRNA) and the crRNA is joined with a transactivating CRISPR RNA (tracrRNA) to form guide RNA (gRNA). The gRNA is bound by the Cas9 protein and causes the enzyme to undergo a conformational change, which activates the two nuclease domains. This enzyme-RNA complex then catalyzes a double-strand break in the target DNA. In the bacterial immune system, this process inhibits the viral infection. Researchers, however, can use this process to target and modify specific regions of host DNA. Great work guys. This was very helpful and informative, I am thoroughly impressed. Helpful article. Such articles make online reading worth for readers like us. Useful information about DNA thanks a lot. pUlr6W wow, awesome article post.Thanks Again. Great.